The day finally came, the day I entered Roccapulco. If Mission on Mission is my Everest then Roccapulco is my Hillary Step—hard to get to, intimidating and a necessary milestone as I continue my journey towards Mission on Mission’s final destination. Located at 3140 Mission Street between Cesar Chavez and Valencia, Roccapulco is tough not to notice with its name splashed brilliantly across a mammoth purple façade and its illuminated marquee hanging over the sidewalk. For this adventurer of the night, Roccapulco has been the biggest “unknown” among the many (relative) certainties along my Mission. Since I started Mission on Mission I have often driven by Roccapulco wondering what my evening there would behold. As I prepared for my Friday at Roccapulco, I had to consider a few extra provisions that, as of yet, I have not needed to negotiate—specifically, purchasing tickets in advance, a dress code and my lack of ability when it comes to salsa dancing. To satisfy Roccapulco’s “no jeans, no tennis shoes” dress code, I donned slacks, a button up shirt and casual shoes. With my $45 tickets in hand, I made my way down the street eager to see if Grupo Niche would live up to their hefty price tag—which was $30 over the club’s usual $15 cover charge. 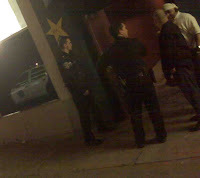 As I approached the club’s grand entrance, I passed a parked police car only to see 3 of our SF’s finest congregating at an open doorway that seemed to tunnel into the club. While there didn’t seem to be any commotion taking place, I took note of their presence which seemed to bolster the many Yelp reviews I have read claiming that this section of the Mission is a particularly rough part of town. I pushed my computer generated ticket through the ticket window and was immediately frisked before being allowed to enter the massive structure. Security seemed to be a big priority at the club, as I evidenced by the swarm of bouncers who circled inside the doorway, dressed in black and chattering through their microphones and earpieces. 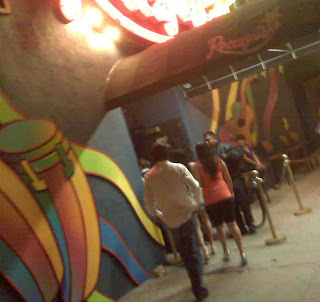 Given the attention paid to its exterior, Roccapulco’s interior décor is disappointing. With a few neon lights peppered throughout the enormous, hanger-like cavern, light was a precious commodity. Serviced by 2 bars—one located at the entrance and another in the back of the club—sweaty, post-salsa patrons eagerly waited to quench their thirst on buckets of Corona. The centerpieces of the club, the dance floor and the stage somehow seemed to make up for the club’s lack of decoration acceptable. I weaved my way to the back bar through the masses as the band played. Circling the dance floor, a multitude of booths hosting groups of 4 to 6 and tables of couples enjoyed their buckets of Coronas as they, along with those looking down from the balcony, watched the ebb and flow of dancers stepping on and off the dance floor. The whole place reminded me of the Havana nightclubs you often see in Mafia movies. Roccapulco intimidated me because I knew that it would require me to scoot my feet and move my hips. Of the many things I’m not good at, dancing and singing are at the top of the list. But, with every sip of Corona my courage grew and I quickly realized that my aversion to dancing was diminishing—I decided that dancing wasn’t that big of a deal. For the crowd, dancing seemed to fluctuate between accomplished Salsa steps (which Roccapulco is know for) to amateur shimmying—feet glued to the floor, shoulders and heads bobbing erratically back and forth. Though I am no salsa expert, I could tell that amongst the flock of tight, bedazzled and sometimes outrageous outfits, the dancers ranged from amateur to experienced. As the band played on I worked my way to the dance floor to cut some rug. It wasn’t pretty and I could tell that my steps were being evaluated by the crowd ranging from 20-something guys who were out on the town with their “chicas” to a 60 year old couple dancing their hearts out. As I scanned my dancing radius, I noticed some less than hospitable looks from guys who were tightly holding onto their ladies—maybe my moves were better than I thought! In the end Roccapulco was as entertaining as any other stopover along Mission Street. 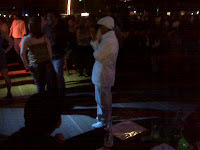 Though the band did not live up the exorbitant ticket price, Roccapulco’s pseudo-salsa dancing make the club a unique and fun experience much in the same way that El Rio’s burlesque show and the Knockout’s live bands make those places the gems they are. I didn’t see any hipsters or Rocabillies but through my research found that there is a large salsa community in San Francisco. I wonder if you have to wear sequins to fit in. 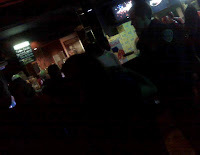 As far as safety goes… my night began with pat down and as I left Roccapulco I passed a pair of cops lingering by the front bar. I felt safer here than in many of the other places in my odyssey. The Mission on Mission “Hillary Step” turned out to be more a figment of my imagination than the reality that is Roccapulco. I don’t salsa yet but the Salsa classes offered on most Friday nights at 8:30pm are appealing. Maybe there’s hope for this Mexican born without any detectable rhythm or soul to speak of.